Kathy Dixon Faucette, 64, passed away suddenly Wednesday afternoon at her home. Kathy was born in Wilson County on November 21, 1954 to Dorothea Pope Dixon and the late George Dixon. She was married to the late Michael Faucette. Kathy was a member of Piney Grove Original Free Will Baptist Church. She was currently employed with The Rudy Theater in Selma where she enjoyed working with the patrons and staff. The family will receive friends on Sunday, December 30, 2018 from 1:00 p.m. until 2:30 p.m. at Kenly Funeral Service. A service to celebrate her life will be held at 2:30 p.m. in the chapel. A private family burial will take place in the Dixon Family Cemetery. 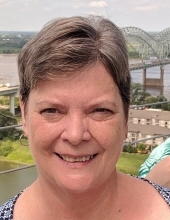 In addition to her mother, Kathy is survived by her son Justin Faucette and wife Sarah of Ridgeland, MS; sisters, Vicky Dixon Pate of Kenly and Georgia Dixon of Wilson; grandson, Elliot Faucette; and her niece Jessica Pate. In lieu of flowers memorials may be made to the American Diabetes Association, P.O. Box 15829, Arlington, VA, 22215. To send flowers or a remembrance gift to the family of Kathy Dixon Faucette, please visit our Tribute Store. "Email Address" would like to share the life celebration of Kathy Dixon Faucette. Click on the "link" to go to share a favorite memory or leave a condolence message for the family.